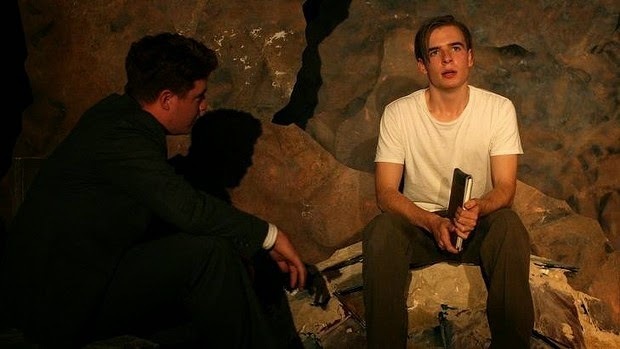 ATYP (Australian Theatre for Young People) and the State Library of New South Wales present, A TOWN NAMED WAR BOY, by Ross Mueller, in the auditorium at the State Library, Macquarie Street, 29 April - 9 May. A TOWN NAMED WAR BOY, is a new Australian play by Ross Mueller. Inspired by diaries of young World War 1 veterans, kept in the State Library of New South Wales' collection, Mr Mueller has crafted a play inventing a counselling session between an ex-soldier and a psychiatrist, to facilitate a travel back to the events of recruitment, training and actual warfare of four young men, Snow (Joshua Brennan), John (Simon Croker), Tom (Brandon McClelland and Huddo (Edward McKenna). The production is in a setting by Adrienn Lord, that looks like one of those wonderful dioramas in the National War Museum in Canberra (recently renovated), 'telling' the stories of the campaigns. The animated images, on this stage, combined with the very effective lighting by Emma Lockhart-Wilson and the accompanying Composition by Steve Francis, and Sound Design by Alistair Wallace make for a very simple imaginative immersion into the world that the writer has conjured. The writing is impressive: tight, compactly elegant, understated and yet highly sophisticated. This maybe be the best New Australian work I've seen this year. The Director, Fraser Corfield, has guided clear performances from the four young men in the cast. The ensemble, on this tiny stage is 'knitted' together with easy mutual empathy, creating collectively, cumulatively, a bond between the audience and themselves that is strong but not sentimental - a danger in other projects that we have seen in this year of ANZAC commemoration. Each of the written, and now embodied characters, are distinctly drawn, and it is the common, innocently simple camaraderie of the group that leaves a lasting impression. There is no jingoism in this script, inspired by the actual diaries of participants, but rather a gentle telling of the human dilemma of being in the experience, in the midst of what was thought to be 'a big Boys Own Adventure Story for King and Country' that became a 'hell' of the realities of bloody, muddy, senseless warfare. Mr McClellend playing the double of the Doctor and Tom, creates a further impression of the insightful delicacy and understated depth of his imaginative creativity (remember M.ROCK, last year) - there is a presence in his work that has a kind of unfathomable but tantalising impact, it carries and element of 'mystery' that commands attention: intelligence, emotional connection and complexities, and yet expressed with extraordinary simplicity. Mr Croker as the sensitive artist and youngest innocent abroad, John, captures one's empathy quickly with a gorgeous openness of playing (assisted by wonderfully "lanky' hair!) - it is John that is the character we identify with easiest and journey with. Mr McKenna, as Huddo, plays with a sophistication of actor's insight that lifts this possibly comic stock character into the realm of a decent and caring man whom we come to admire and rely upon - beneath the jokey 'bravado' is a loyal and complicated human - Huddo's loss to the tragedies of war is all the more devastating, not just because of its understated handling in the writing, but because of the qualities Mr McKenna has drawn for us to induce the caring we, as an audience, have endowed on him - it becomes a very personal tragedy. Mr Brennan, playing the survivor of the boy/men, Snow, suffering from the anxieties of the experience on his return home (post traumatic stress), moves between the aftermath and the journey of war with clear sighted ease. However, the performance lacks the same level of emotional complexity and rather is a servant of objective storytelling function - it does not reveal much connected emotional inner life to the trauma of the man - and so, it is more difficult for us to have any true, or relative empathy, as compared to the other characters, for Snow's experience - it is a tendency of 'style' that I have observed before in the work of Mr Brennan: THIS IS OUR YOUTH and M.ROCK, last year - reliable, two dimensional and internally cool. A TOWN NAMED WAR BOY is another work from Mr Fraser as Director, during his Artistic Direction of ATYP, that has lifted the quality of work, particularly new Australian work at ATYP, to be an anticipatory event in our diary of Sydney theatre going - SUGARLAND and M.ROCK last year, for instance. This production of this very fine play by Ross Mueller is having a short season at the State Library auditorium, but is worth catching. If it tours, let us hope it shows again in Sydney, proper, for not only is it a play that commemorates the Centenary of the ANZAC story with due dignity and integrity, it is a very fine piece of theatre literature that will be relevant beyond this event - the humanity of the characters drawn, and the craftsmanship of Mr Mueller, is exemplary. We need to see more of his artistry, on our stages, CONSTRUCTION OF THE HUMAN HEART and CONCUSSION, two other works of skill, worth seeing again, I reckon.